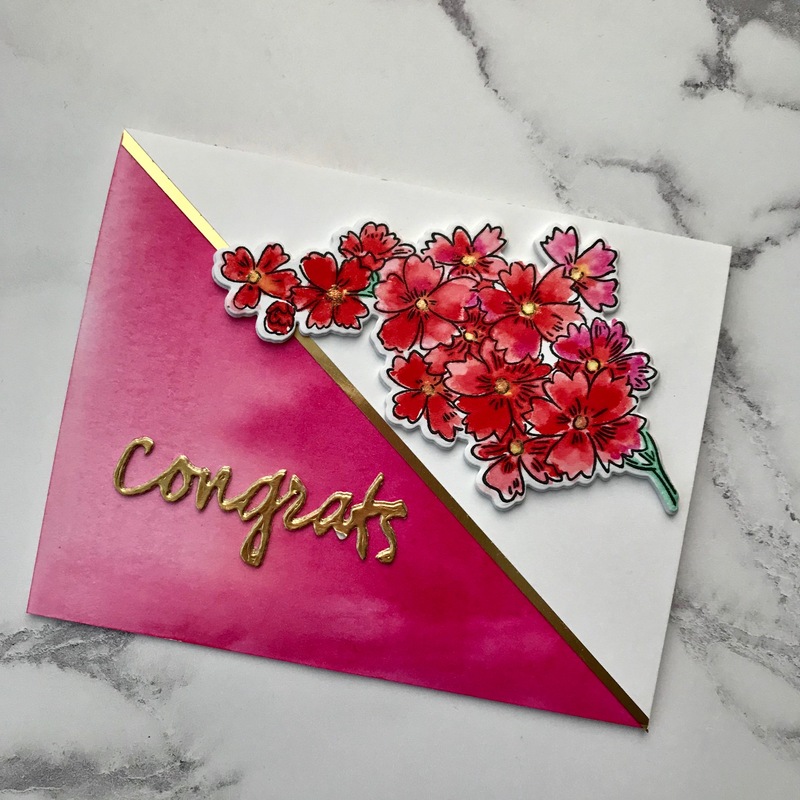 I love the vibrant pink and reds in this congratulations card! The card was inked/water colored using Distress Inks re-inkers. I placed a few drops of each of my chosen colors into separate wells of a small plastic palette and used them as if they were watercolors. The gold centers of the flowers coordinate the thin gold stripe and sentiment. I’m really pleased with the overall results. For the fuchsia-toned background, I started with watercolor cardstock (Tim Holtz), wet the cardstock, and then used a paint brush to swipe color onto the cardstock. I started with my lightest color first and then gradually switched to dark shade and then darker shade of pink/red. I used 3 colors in all for the background and they are listed below in the supplies. The paper was well saturated with water and watercolor and I turned the piece of watercolor on its end vertically to let the lightest color run down into the darker colors. I also swiped the running colors with my paintbrush, so the cardstock was fully covered with color. I put the watercolor cardstock to the side to dry and later used a heat tool to make sure it was fully dried before assembling the final card. Stamp the floral image onto watercolor cardstock using a waterproof ink or one that is appropriate for water coloring. Color the images with the chosen colors. The watercolor cardstock was dry, only the brush was wet with watercolor. After the flower image is completely dry, add gold watercolor ink to the centers of the flowers. For the sentiment: Die-cut the sentiment from gold foil cardstock three times. Adhere the three sentiments on top of each other for a raised, dimensional effect. Cut a piece of white A2 cardstock on the vertical (longer) diagonal (from corner to corner). Use one of the diagonal cut pieces for the top half of the card. Cut a strip of gold foil cardstock and adhere it to the back of the white diagonal piece. Die-cut the water-colored floral piece using the coordinating die. If you don’t have the die, just fussy-cut the piece. Mount foam tape to the back of the cut out floral piece. Adhere the white diagonal piece to the top part of the water-colored background. Note: decide which side of the water-colored background you want to be visible. Adhere the floral piece to the white diagonal piece. Adhere the dimensional sentiment to the bottom part of the card front. Adhere the completed card front to a card base. Stamps: Altenew: Starry Flowers stamp set. Dies: Altenew: Starry Flowers coordinating die set; Papertrey Ink: Wet Paint Cuts III die set (word “congrats”). Inks and Watercolors: For the card front background: Distress Inks in Worn Lipstick, Fired Brick and Picked Raspberry. For the floral piece: Distress Inks in Worn Lipstick, Fired Brick, Picked Raspberry and Barn Door. For the floral stem: Cracked Pistachio. For stamping the floral image: Versafine Ink in Onyx Black. For centers of the flowers: Kuretake Gansai Tambi Starry Colors set (Light Gold color). Cardstock: Tim Holtz Distress Watercolor Cardstock; Neenah Solar White 80# (white diagonally cut piece); gold foil cardstock (from my stash). Neenah Solar White 110# (card base). Hope you like the card. Have a great day! 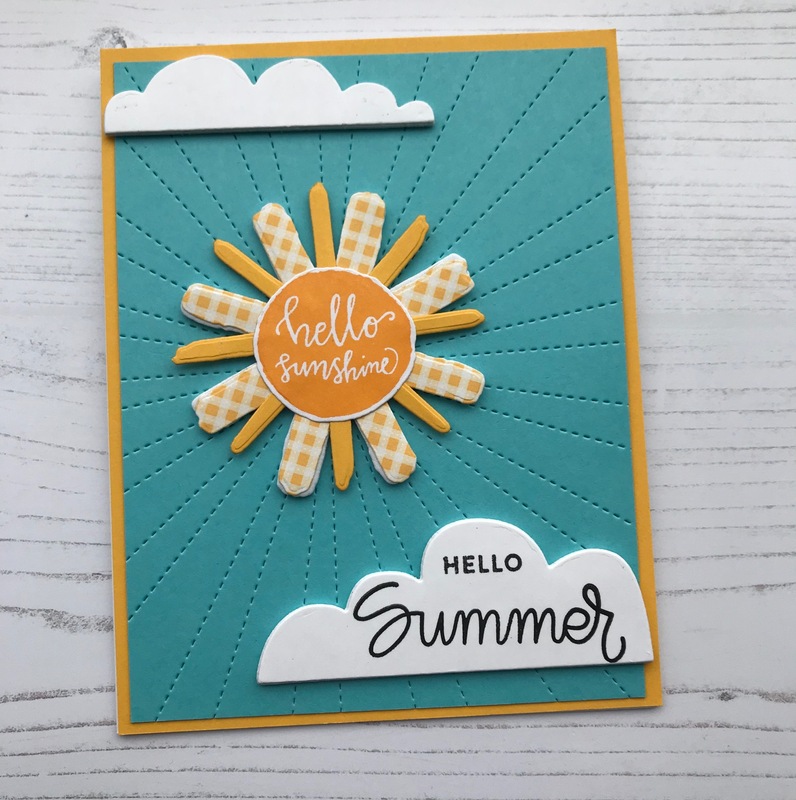 I wanted to create a cheery summer sky and sentiment to imitate those bright sunny days in the summer when the sky is so blue and only broken up by the occasional puffy, billowy cloud. These flat-bottomed cloud dies are so cute. 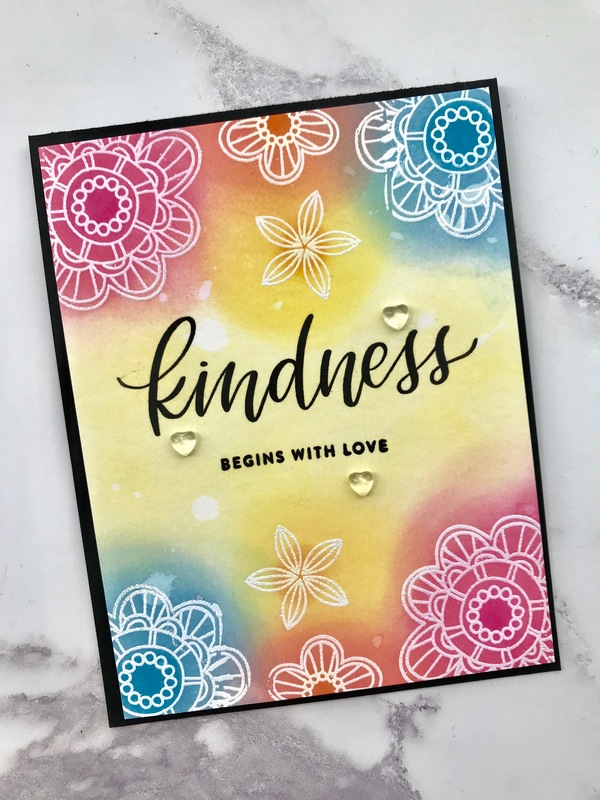 They add an interesting graphic shape to the card and are the perfect size for stamping a small sentiment. Unfortunately, these cloud dies are by Simon Says Stamp and are no longer available. However, you could use another cloud wafer die set by SSS or many other cloud dies made by other companies. Also, you could even cut out your own clouds from white cardstock! Stamp the sun circle with the stamp from the stamp set onto white cardstock using yellow ink. Die cut the stamped sun circle. Die cut and it sun rays using coordinating solid and patterned yellow card stock. Adhere/assemble the sun circle and the sun rays together, forming a sunburst. Die cut the clouds from white card stock. Die cut the stitched sun rays cover panel using blue cardstock. Cut an A2 sized mat in coordination yellow card stock. Trim the stitched sun rays panel 1/8-inch on all sides (panel with be 4 inches x 5.25 inches). Adhere the trimmed stitched rays cover panel to A2 yellow card stock mat. For the sun and rays, adhere the sun circle and rays to each other as shown in the card. Stamp sentiment onto the larger of the two puffy, flat-bottomed cloud. Adhere the clouds, sunburst image as shown in the image of the card using foam tape to give the pieces added dimension. Mount the entire card front onto an A2 portrait-oriented card base. Stamps: Reverse Confetti: My Sunshine stamp set; Simon Says Stamp: Four Seasons stamp set (sentiment). 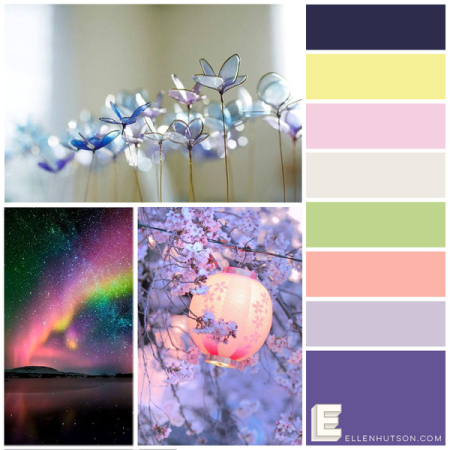 Dies: SSS: Flat-Bottom Clouds (no longer available), but there are so many other cloud dies on the market that could be substituted; Reverse Confetti Cuts: My Sunshine coordinating dies to the My Sunshine stamp set; Reverse Confetti: Stitched Sun Rays Cover Panel. Inks: Catherine Pooler Inks: Tiki Torch (for the sun); Versafine Ink: Onyx Black. For the sun rays: Papertrey Ink: Summer Sunrise for solid rays and Papertrey Ink patterned paper in Summer Sunrise. For the stitched sun rays panel: Papertrey Ink: Hawaiian Shores. For the mat under the sun rays panel: Papertrey Ink: Summer Sunrise. For the card base: Neenah Solar White 110# cardstock. For the sun circle and clouds: Neenah Solar White 80# cardstock. Hope you like this project. Have a great (and sunny) day! Summer is starting to heat up where I live in the Midwest (pun intended). It’s been cooler than average and very rainy but starting to get warmer. I don’t now if the rain will abate though. This card was created to start off summer. I love the fresh greens and yellows and the overall tropical feel to it. The background stamp is a bold graphic, but you can also use it for a tone on tone effect for a subtler look. I love this background because it has such a distinct pattern and you may be seeing it on other cards I make. Stamp the background stamp onto an A2-sized piece of white cardstock with green ink. 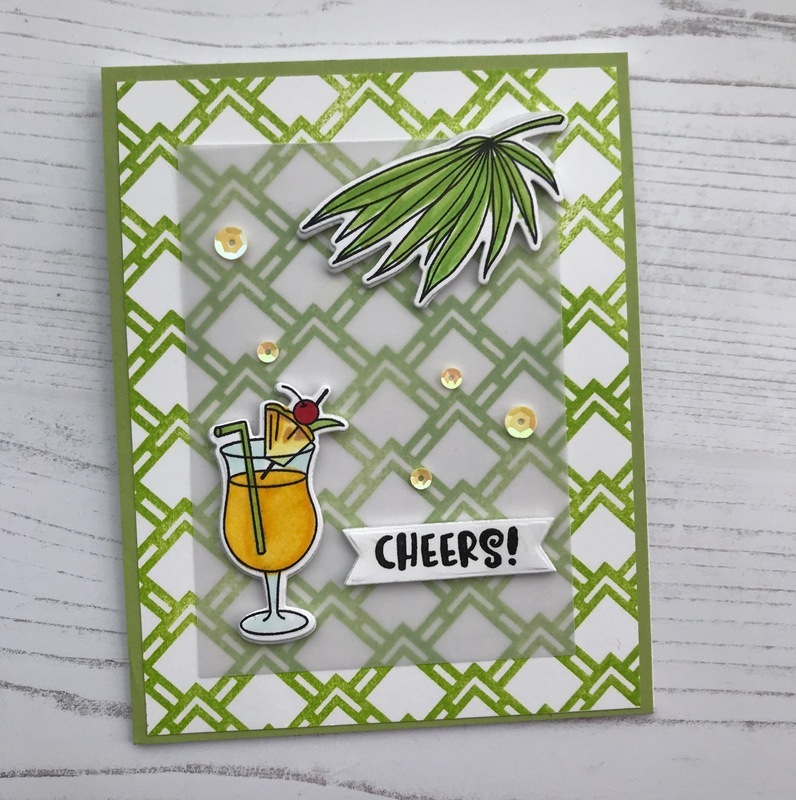 Stamp the tropical leaf, beverage image and the “cheers!” sentiment onto white cardstock. Color the beverage image and the tropical leaf with Copic markers. Die-cut the beverage image, tropical leaf and sentiment if you have coordinating dies for them. Note: the sentiment doesn’t have a coordinating die, so I used a tiny banner die that fit the sentiment perfectly. You may also fussy cut the images if you prefer. Put bits of foam tape behind the tropical leaf, beverage and sentiment banner for added dimension. Adhere the die-cut images and sentiment onto a 3-inch by 4.25-inch piece of vellum. Cut down the background stamped piece to 4-inch by 5.25-inch. Mat the background piece to an A2-piece of coordinating green cardstock. Mount the vellum piece in the center of the card front (background plus green mat). Adhere the entire card front to an A2 card base. Stamps: WPlus9: Tropic Fever stamp set (background and tropical leaf); Newton’s Nook: Cocktail Mixer stamp set (beverage image and sentiment). Dies: WPlus9: Tropic stamp set coordinating die set (for tropical leaf); Newton’s Nook: Cocktail Mixer die set (for beverage); My Favorite Things (MFT): Die-namics Fishtail Sentiment Strips (smallest fishtail strip). Inks: Memento Ink: Tuxedo Black (Copic-friendly ink); Versafine Onyx Black ink (sentiment); Hero Arts Bold Ink (Hybrid Ink): Green Apple. Copic Markers: For the beverage: Y13, Y19, YR12, E12, YG25, BG10, R49; For the tropical leaf: G14, YG25, YG05. Cardstock: Neenah Solar White 80# for stamping background and images; Neenah Solar White 110# for card base; Papertrey Ink cardstock in Green Parakeet (for mat); Bazzill Vellum 40#. Other: Hero Arts Ombre Sequins in Sunshine. Hope you like this card. Have a great day! 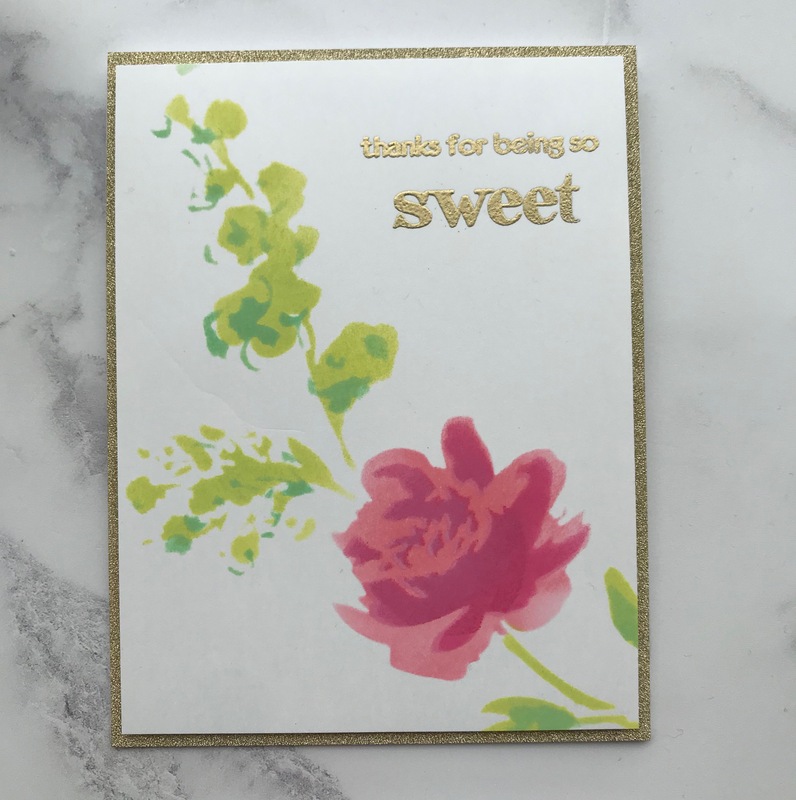 This is a sweet thank you card for a very sweet person. I love stencils and the fact that they are a simple, low-tech craft supply that you can use to great advantage. You can ink up a stencil, apply embossing paste, sprays and even use them as an embossing folder! Also, they are very reasonable priced. I used a floral stencil by Altenew that has layering image options. 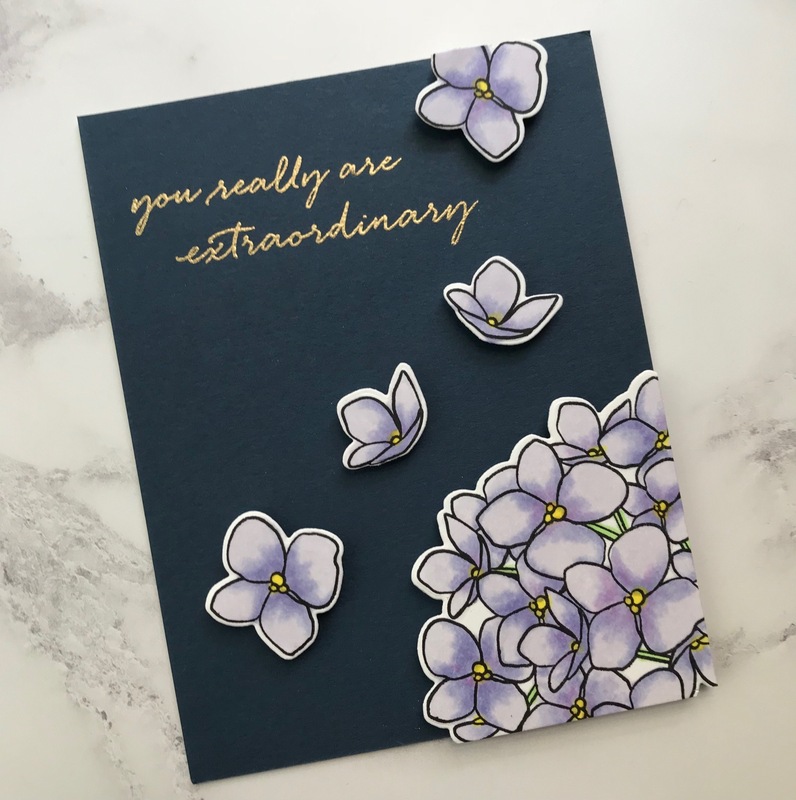 I placed the main floral image on an A2-sized card front and then started to ink the flower and leaves using a round foam sponge on a round mini ink blending applicator. I used Distress Oxide inks because I wanted to create a soft watercolor look. The ink had to be applied carefully since the stencil has delicate details in some parts and I didn’t want to rip or bend the stencil. I used more of a pouncing motion on the stencil to ink up the images with the foam applicator. When the image was dry, I lined up the other shadow images over the main image to add shadows to the leaves and flower and inked the images with darker inks. This technique could be called a two-step stencil layering process, like two-step stamp layering. I then again let the ink dry because I was going to heat emboss my sentiment and didn’t want the embossing powder to stick onto any of the damp inked images. I noticed that after the shadow layer of ink on the flower had dried, the ink dried so that there was no shadow distinction. Therefore, to create more shadow, I reinked the shadow area with a much darker ink (not using a Distress Oxide). When the flower dried, the shadow was now more distinct from the layer underneath. I stamped the sentiment using Versamark ink and heat embossed it with gold embossing powder and then trimmed down the card front to 4” x 5.25”. I placed foam tape on the back of the card front and adhered the front to an A2 mat of gold sparkle paper. Then the entire front was adhered to an A2 card base. Stamps: Altenew: Folksy Florals stamp set (for the sentiment). Stencils: Altenew: Watercolor Bouquet stencil. Cardstock: Neenah Solar White 80# for card front; Neenah Solar White 110# for card base; Gold glitter paper for mat behind card front. Other: Brutus Monroe embossing powder in Gilded; Ranger round ink blending applicator and Ranger round blending foam. The Simon Says Stamp Flickr Challenge #98 requires using any kind of embossing on your project. I employed an emboss resist technique, with ink blending using Distress Oxide Inks. My aim was to create a bright, but soft look. Prep a piece of A2 Distress Watercolor Cardstock with anti-static powder (e.g. Embossing Buddy bag). Stamp the floral images onto the watercolor card stock using Versamark ink. Cover the stamped images with white embossing powder, tapping the paper to remove any excess, and heat emboss with a heat tool. Blend Distress Oxide inks over the embossed images, making sure that there is a slight blending between the colors. Use a sponge dauber to color and blend the center of the floral images with a slightly darker ink in the same color family as the colored flower. Blend light ink in the middle of the cardstock where the sentiment will be stamped. After blending the colors, sprinkle water drops onto the card front and blot excess water with a paper towel. Dry the entire card front with a heat tool. Trim the card front to 4” x 5.25”. Stamp the sentiment onto the card front. Adhere crystal heart drops to the card front. Adhere a piece of fun foam to the back of the card front. Mount card front onto an A2 portrait-oriented, top-folding, black card base. Stamps: Simon Says Stamp: Look for the Miracles stamp set (flowers; Simon Says Stamp: Kind Flowers stamp set (sentiment). Distress Oxide Inks: Worn Lipstick, Abandoned Coral, Picked Raspberry, Squeezed Lemonade, Spiced Marmalade, Broken China, and Mermaid Lagoon. Other Inks: Versamark (for embossing); Versafine Pigment Ink in Onyx Black (sentiment). Other Supplies: Studio Katia: Clear Hearts; Hero Arts White embossing powder. Cardstock: Tim Holtz Distress Watercolor Cardstock (card front); Papertrey Ink: True Black cardstock (card base). For this project, I cut up a sentiment from the Kind Flowers stamp set so that the words ‘begins with love’ could be stamped alone.